Looking for inspiring traditional living room ideas? The term ‘traditional’ can mean a plethora of different things to different people, and there is no established design formula. 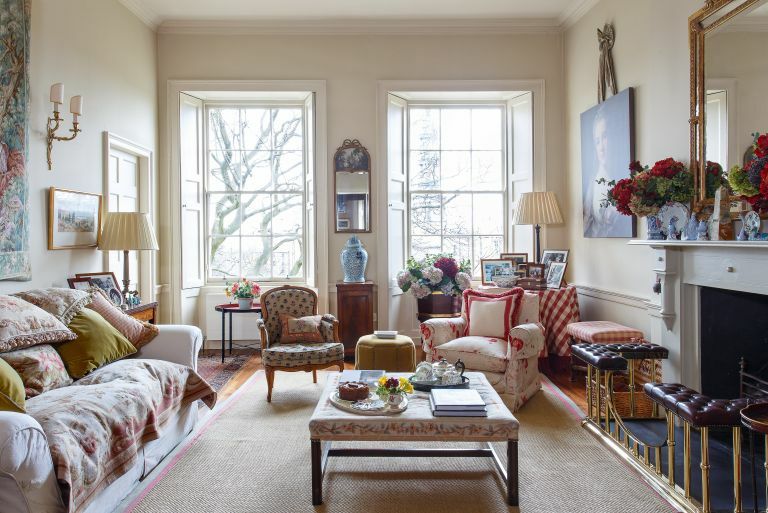 From the sparse-but-cosy cottage look to the joyful excess of a Louis XIV style, the design possibilities that can be termed 'traditional' are almost endless. We take you through some of the most beautiful (but easy to achieve) design ideas for traditional living spaces, paying attention to furniture, colour schemes, and paint ideas. And when you've settled on a design scheme you love, get more practical advice on how to design a living room. Grey is wonderful option for any living room, and it lends a traditional living room an understated and airy quality that is timeless. However, an all-grey colour scheme can look a little severe, especially in winter. Adding a bit of floral pattern can really bring a grey room to life. This grey living room features curtains made from the Adachi Celadon fabric by Designers Guild. Love grey? We have 16 gorgeous grey living room design ideas. For an elegant, traditional look, opt for darker, traditional paint colours, or, if you aren’t ready to commit to the dark paint trend, try painting one wall to make a statement. A warm colour scheme would be more fitting with the traditional design so if you are sticking religiously to the style, opt for warm neutrals, purples, reds and forest greens. Alternatively, bright whites and cool grey tones can create a simple clean backdrop for your more traditional furniture. The joy of traditional rooms is that they can be totally individual, with furniture and decorative pieces collected over a period of many years. You can, of course, go for a restrained, colour-coded design, but if nothing in your living room matches, it's not necessarily a problem. Follow your intuition and embrace as many different colours and patterns as you like. There's one golden design rule, however: if your walls and floors are covered in pattern, keep the furniture plain. And vice versa: if you love a chintzy sofa, resist the temptation to also lay a floral rug underneath it. Roughly, 50 per cent of the room should be pattern, and 50 per cent plain colour. This quirky cottage living room design in anchored by a velvet sofa from Sofa.com and an upholstered armchair from Hana & George. For more gorgeous velvet sofas, browse our 12 statement velvet sofas. Pastels work wonders on traditional living room schemes; they're a perfect match to the gentle curves of traditional furniture, and make a wonderful contrast with wood flooring. You can keep to just one colour for an instantly memorable look, or mix and match pastels for a mellow effect. For a similar sofa, try the Bluebell sofa in Azores fabric from Sofa.com. And for more pastel schemes, have a look at our 10 pretty pastel decorating ideas. Ensure that your living room storage solutions fit perfectly in a traditional space by salvaging vintage pieces. Maybe you fell hard for an ornate chest of drawers that doesn’t quite fit in your bedroom or inherited an old china cabinet – think of ways they can be incorporated into your living room as extra storage. A china cabinet could easily be repurposed as a display unit for books or DVDs and chest of drawers would make a fabulous sideboard. If your vintage finds don’t quite fit with the vibe you are going for, try painting your furniture. Wallpaper is easy to apply and works well with most traditional decorating schemes. And you can really go to town with pattern and colour, provided the rest of the room is kept relatively neutral. We love the way the emerald green of the Atacama print wallpaper by Farrow & Ball contrasts with the natural tones of the furniture and flooring in this living room. For more ideas, check out our 10 statement living room wallpaper ideas. If you are the lucky owner of a period cottage, then it's likely you are also the proud owner of a lovely garden. And even if not, but you want to create cottage-style charm in your living room, a botanical theme is always a winner. The rustic wooden beams and spare furnishings of a cottage really work with botanical prints and flowering indoor plants. Find out more about transforming your home with house plants. Want a dainty living room with a bit of a French twist? Sumptuous seating is key. Louix IV chairs may be a design cliché, but they will come into their own in the right setting. Mind, opulent traditional seating is the furniture equivalent of lipstick: if you use them, the rest of the room will need to be quite 'made up' too. Think gilded mirrors and oil paintings, and thick carpets. For the real deal, head to Lordfords Antiques. For affordable alternatives, try Wayfair. Well-crafted wooden furniture instantly elevates the look of any room, traditional or modern. Less is more, and an imposing chest of drawers made from solid wood may well be all that your room needs. The chest and desk in this living room are both antique pieces; for traditional pieces that are new, try Cotswold Co.
To make an informed choice, consult our guide to choosing living room funiture. Cottage living has one drawback – low ceilings. If you live in this type of property (or any other low-ceilinged home you are redecorating), avoid dark colours, opting for light-reflecting off-white instead. The best off-white paints for traditional living rooms are from Farrow & Ball, in our opinion. Explore the almost endless potential of white in our 15 white living room design ideas. If your living room is tiny, our advice is: 1) avoid cramming the space with too much furniture; 2) experiment with a bright wall colour. Resist temptation to just paint the small room white, as that can accentuate the small size. A vibrant colour, on the other hand, will add dimension and distract from the room's size. A zesty yellow is an excellent (and underrated) choice. Try Dayroom Yellow for a similar effect. Need more ideas? We have 10 of the best paint colours for living rooms. If your home comes with an original period feature, such as a fireplace or original stove, make the most of it. Let it take centre stage in the design scheme by keeping the decorating scheme neutral. A living room so sumptuous that it feels more like a bedroom... this is probably not the best option for homes with small children or pets, but if you want a living room that screams luxury, then pile on the cream. You really can't go wrong with the warmth it brings to a room (unlike white), and an all-cream scheme will really bring out all the different textures of your soft furnishings. Want a traditional living room with a twist? An easy way to give your room an update is by introducing some Mid-century-style pieces into the decorating scheme. They will not jar like contemporary furniture would, but will give the room a more up-to-date look. Want the Mid-century effect without the price tag? Try accenting the room with an orange piece or two. The colour of the 1960s, orange will add a vintage playfulness to the room. For a stylish orange armchair with a Mid-century vibe, try John Lewis. We have 12 Mid-century decor ideas for even more inspiration. If your living room faces a lovely garden, why not create a link betwen the outdoors and indoors with some lovely rattan furniture? You can take it outside on warmer days but keep it out of the cold and wet in the winter. Here are more tips on linking your indoor and outdoor spaces.